When it comes to exterior doors, you’re not likely to find a company serving the Baltimore, Maryland, area that offers a larger selection of premium products and better installation services than Roland Slate Service Company. Since 1989, customers have turned to us because we are a family-run company that can offer the personal touch they are looking for – not to mention that we offer some of the best exterior doors available on the market today. Entry doors – We have durable steel and fiberglass front door options that can stand up to the humid summers and frigid winters we often experience in the Baltimore, MD, area. They are also available with a variety of customizable aesthetic options, such as handles, glass inserts, grid patterns, finishes, and more, so you are sure to find what you’re looking for. Sliding glass doors – With a double-walled, multi-chambered frame, our exterior sliding patio doors can stand up to almost anything Mother Nature has to offer. They also have closed-cell foam gaskets and double weatherstripping for an air-tight seal, making them very energy efficient. 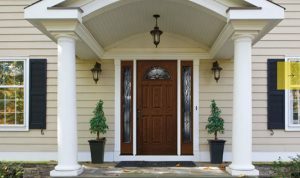 Storm doors – For protecting and preserving the beauty of your home’s entryway, our storm doors are the perfect product. Plus, they can be customized to integrate seamlessly with the existing style of your home. Whether you choose a durable entry door, a beautiful sliding glass door, or a protective storm door, you will be glad to know that all of our exterior doors are covered by a lifetime material warranty from the manufacturer. What’s more, we offer a one-year labor warranty on our installation services, for that extra peace of mind you deserve. To browse our wide range of exterior doors, contact Roland Slate Service Company today. You can learn more about the benefits of investing in a new door for your Baltimore, MD, area home by scheduling a free in-home consultation with one of our product specialists.